"Reading maketh a full man; conference a ready man; and writing an exact man..."
Apr 03 2009 Exstora version 2.4 and 2.4 Pro released. Oct 16 2007 Website was translated to German. Thanks to Dennis Alperstedt! 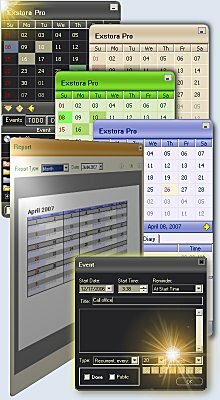 Schedule events with a couple of mouse clicks using a handy planner (Gantt Chart). Make notes and maintain a diary with ease. Exstora Pro values your time! © 2010, SLOTIX s.r.o. All rights reserved.